Actually, not that many places. Click on the map to investigate the access situation in England, Scotland & Wales. This will take you to an an interactive map of UK rivers, setup and maintained by volunteers to monitor the changing access situation. It also details access incidents where paddlers have been challenged for paddling a river. If you have any current information or incidents to report on local rivers, please submit it using the “report an incident” link in the white box that appears when you click on a river. This site relies on feedback from actual paddlers. The “relevant links” page is packed with useful background on the fight for access over the years. 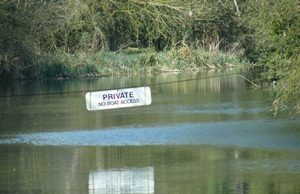 Landowners, Angling Associations and even the government are promoting Voluntary Access Agreements (VAAs) as a solution to the poor access situation. These have failed to deliver improvements over the last 30 years and are often mechanisms to prevent paddlers using rivers rather than to encourage them. These so called “agreements” are repeated all over the country and it is important to try where you can to make sure permissions have been granted.